I didn't hear back from the Kansas Judicial Qualifications Commission on Friday after the hearing nor throughout the day on the ensuing Monday, which suggested the efforts to sweep this matter under the rug are continuing. Based on the overwhelming evidence against the woefully corrupt Judge Ron L. Svaty, I should have heard back from Carol Green, the Chief Administrator for the Commission reviewing the complaint. Therefore, on Monday afternoon, I sent even more compelling evidence that illustrates how truly dangerous this Svaty character truly is -- it is reproduced below. It is critically important that you really get to know me and my family. And to this end, I released another video titled "Closer to the Edge of Glory", which is a "must see" for the Commission in the context of the subject complaint -- it can be accessed by clicking here. I describe this video montage as a "must see" because it further underscores why Judge Ron Svaty of Ellsworth County, Kansas MUST be removed from “the bench” within the Kansas Judicial Branch (“KJB”) and disbarred from practicing law altogether. It is not that he is incompetent -- nor is it that he is ignorant of the operative law. Simply stated, he is criminally corrupt . . . as is the woeful attorney he colluded with (Jane Isern) in their baseless and entirely orchestrated travesty to take away Ryan's half-brother (Jackson) from his father (i.e., me). In addition to there being no justifiable basis for such a draconian action by a judge with NO JURISDICTIONAL AUTHORITY WHATSOEVER, it is well documented that I have successfully raised three highly impressive young men --Michael (aged 24), and twin sons, Kevin & Ryan Young (aged 22), serving as their coach in virtually every one of their grade school teams -- click here for details. Michael and Kevin Young graduated from Duke University with honors in 2008 and 2011, respectively. Ryan will officially graduate from University of Maryland this summer, as he had to defer some classes to care for his dying mother in the hospital this Spring -- the video montages Forever Young (accessed by clicking here) andBeautiful Maria of My Soul (accessed by clicking here) explain why this was the case. Currently, my son Ryan is perhaps the most well known lacrosse player in the United States, and lacrosse is also the fastest growing sport in America. Ryan's celebrity was cultivated over many years, but this became especially pronounced over the past few months, as he was embraced by the media and endeared to the public because his "story" tugged on the heartstrings of millions who watched his many nationally televised games, and read about him in the countless articles written. This is apparent in the above "Closer to the Edge of Glory" video, as well as from his numerous televised interviews, some of which have been memorialized in the "Ryan Young Interviews: Say What You Need To Say" digital short, which can be accessed by clicking here. To gain an understanding of Ryan's vast accomplishments, a video chronicling Ryan's earlier achievements is captured in Ryan Young & Maryland Lacrosse: Magnificent, which can be accessed by clicking here. Ryan's older brother, Michael also achieved significant success on the collegiate lacrosse field, which is memorialized in the digital short titled: "Neverending Story", which can be accessed by clicking here. 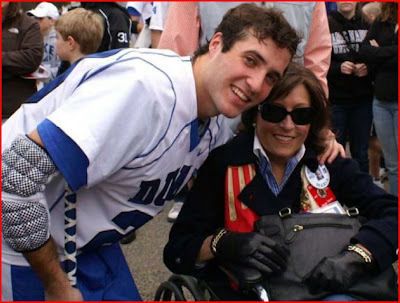 I am still working on a video montage for my son Kevin, but suffice it to say, although he was hampered by chronic injuries throughout his collegiate career, he is the only one among the Young brothers whose collegiate lacrosse teams made it to the Final Four EVERY YEAR, and he is the only brother who has won a NATIONAL CHAMPIONSHIP ! And this year was the first time in NCAA lacrosse history that brothers opposed one another in the Final Four. Kevin is pictured below with his mother shortly before she passed away. And you can learn more about me, my philosophy and ideals by visiting my corporate website (by clicking here) and my self-actualization website (by clicking here). My detractors desperate to cover-up a massive series of frauds in the MorganStanleyGate scandal involving now billions of dollars (click here for an overview) will point out: (1) my wife (Maria) divorced me after 24 years of marriage; (2) my relationships with my older sons are strained; and (3) my fiancee' (Leah Krier) left me and took away my toddler son, Jackson (with the assistance of Judge Svaty and Jane Isern). This was all orchestrated, and byproducts of the fraud-induced theft of my $46+ million net worth (click here for details) and deprivation of what was a consistent seven-figure annual income, so I would not have the resources to pursue my mounting claims against Morgan Stanley, and their operatives. And because I was victimized by this audacious fraud and grand larceny, denied ANY legal representation (violating my right to legal due process), and unlawfully deprived of a livelihood, my loved ones were duped into thinking I had abandoned them, when nothing could be further from the truth. Some things are out of my hands at this point -- for instance, Maria passed away in April this year, and Leah's nervous breakdown after our wrongful Chapel Hill condo eviction on a mortgage that was NEVER late, NOT delinquent, and PAID-IN-FULL has transmogrified her into someone I no longer know. However, I intend to have ALL FOUR of my sons back in my life and reinstate the close loving relationships I had with each one. To this end, I produced a video this past Father's Day to make these intentions and my unwavering resolve very clear -- it is from the heart and is titled "Before We Turn To Stone" (click here to access). Although there has been an earlier attempt to sweep this complaint under the rug, I have undertaken comprehensive actions to ensure it doesn't happen again . . . and I want to be clear: The ONLY acceptable result of this complaint will be the disbarment of Judge Ron Svaty and attorney, Jane Isern. And I want to caution you against reiterating the your nonsensical dismissive initial response -- this is NOT an issue about the interpretation of facts and law to be addressed through the appeal process (which would have been jerry-rigged any way). This is a matter of CRIMINAL WRONGDOING, which only an unbiased investigation will reveal . . . and the evidence in obvious. This CRIMINAL WRONGDOING by Judge Svaty and Jane Isern is yet another element in the desperate cover-up effort in the MorganStanleyGate scandal. 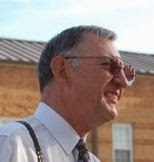 And Judge Svaty was recruited to fulfill an important role -- for he was to further smear my reputation by rendering a draconian decision that would suggest I was someone akin to being a violent domestic abusing drug addict and felon. And since this over-the-top decision was coming from a pedigreed judge with a law degree from a top law school (Stanford) and from an entirely different state jurisdiction (Kansas), it would also serve to undermine the allegations of extensive corruption exposed in the state of North Carolina, which is where Morgan Stanley's Chairman of the Board and former CEO, John Mack was born, raised and educated (he is an alumnus of Duke). John J. Mack is the person chiefly responsible for transforming MorganStanleyGate into a scandal of epic proportion, even though he was availed an opportunity early on to quickly rectify this matter (click here). And I intend to expose and fully prosecute him, along with other monstrous banking executives involved in this sordid mess, most notably, Bob Hatley (CEO of Paragon Commercial Bank, based in Raleigh, NC), Bob Steel (former CEO of Wachovia Bank) and Jack Clayton (Regional President of Wachovia Bank), along with exceptionally unethical attorneys at prominent law firms who served these banking institutions. This is not just about reclaiming what was stolen and reuniting with my loved ones, but also about exposing bank-induced fraud, widespread corruption, the affront to the integrity of the U.S. System of Justice, and assault on U.S. citizens' rights. Ergo, failure is not an option.